The flavorful shiitake mushroom is native to Asia where it’s been harvested wild from forestlands for centuries. Commercial production was introduced in the 1930s first by inoculating select logs, and later by growing mushrooms on sterilized sawdust which sped up production. As its taste and nutritional value become more and more known and desired in north America, shiitake mushrooms present another possible niche farm crop to consider. This crop can be sold in a variety of ways, including as fresh mushrooms, as dried mushrooms, as pre-inoculated shiitake logs or sawdust blocks for backyard or tabletop shiitake mushroom growers, and of course as further value-added culinary products that contain the mushrooms. Even the resulting “mushroom compost” can be a valuable garden product. For actual spawn production, a sterile or at least very clean laboratory type environment is called for. But the purchase of spawn is relatively inexpensive. Also, in some states, a certified kitchen is required to produce and sell value-added food products such as mushroom soup. But the production needs of the other shiitake products can usually be set up on a typical working farm. Cascadia Mushrooms of Bellingham, Washington is a USDA and Washington State Department of Agriculture certified organic producer of gourmet and medicinal mushrooms, including shiitake. It was founded by Alex Winstead, who studied mycology, botany, and organic chemistry in college before starting the mushroom farm in his rented suburban basement and garage. Eventually moving to its current location, Cascadia Mushrooms now offers fresh shiitake and other mushrooms directly to consumers and professionals through the farm’s website, farmers’ markets, and relationships developed with chefs and grocers. The farms sells mushroom kits and spawn also through farmers’ markets, as well as online from their website and through garden centers. The farm holds mushroom growing workshops and also sells medicinal mushroom products. Finally, Cascadia Mushrooms sells mushroom compost in limited quantities by appointment direct from the farm. “Shiitake is such a great mushroom to grow and eat for many reasons.” Winstead said. “They are well-adapted to the Pacific Northwest maritime climate--this makes the growing season fairly long without the use of supplemental heating or cooling--they like to grow between 55 and 75 degrees Fahrenheit. “They have an excellent shelf life. Fresh shiitake can be cooked and eaten with a freshly harvested flavor up to seven or 10 days after picking. Dried shiitake can last for two or more years in a sealed container. In the wild, shiitake mushrooms grow on fallen forest hardwood logs, and there are many different strains of shiitake. The Eagle Bluff Environmental Learning Center of Lanesboro, MN (see resources below), for example, researched 52 different strains of shiitake to determine the best for cultivation on hardwood logs. Spawn suppliers offer warm weather, cold weather and wide range strains based on the temperatures needed for fruiting. Some cool season strains fruit between 41 and 68 degrees F. Warmer season strains can fruit in temperatures as high as 86 degrees F.
Growing shiitake mushrooms on sawdust or logs… or both? It’s widely asserted that log-grown shiitake vs. sawdust grown most closely mimics nature and is a desirable choice as compared to large commercial, sawdust-grown shiitake. As well, log grown shiitake have commanded higher prices over sawdust grown shiitake, with log-grown enthusiasts insisting the flavor, nutritional value and texture are superior with log-grown mushrooms. But Cascadia Mushrooms has a different theory and grows only a small portion as log-grown, using sawdust as the growing medium for most of its crop. Winstead states that growing them “indoors vs. outdoors” also plays an important part in the quality of the mushroom. “We grow almost all of our mushrooms on alder sawdust that is supplemented with bran and rye,” Winstead said. “In my experience, it's not the log itself that grows a different mushroom but whether they are grown outdoors or indoors, the climate and temperature at the time of growth, and the shiitake strain being cultivated.” Winstead explained that natural UV light, the wind, the shifting temperatures and so on seem to play a part in the difference in mushroom quality when grown outdoors. “99% of the fresh and dried shiitake available at stores and restaurants are grown indoors on a sawdust media. The industry shifted to growing primarily on sawdust under controlled conditions over the last 25 years. “But if you take one of our shiitake sawdust blocks and grow it outdoors it will be almost identical to those grown on logs. Conversely if a log is grown indoors under controlled conditions the opposite will be true and the mushroom will resemble a typical commercial sawdust-grown shiitake. Sawdust growing has a greater potential to create a sustainable and profitable farming enterprise where shiitake or other mushrooms are the primary product. While Winstead grows in a farm setting, timberland owners looking for sources of forested income may also want to consider log-grown shiitake. Cornell University in New York (see resources below) has studied eastern forest grown shiitake and provides educational materials and workshops for those interested in pursuing such an enterprise if their timberland supplies sufficient hardwood. The hardwood species suggested for shiitake production include oak, chinkapin, hornbeam, sweetgum, poplar, alder, maple, ironwood, beech, and birch. Besides assessing one’s local log or sawdust resources for deciding which to use for growing shiitake, an aspiring mushroom farmer can also consider his or her community who will buy the mushrooms. Is log-grown specifically in demand in the farmers’ customer base? As with direct-sale local farmers who grow vegetables, the “know your local farmer” trend also plays a part in whether a farmer chooses to grow in sawdust or on logs (or both). If the farmer can explain his or her operating method direct to customers -- such as the unique quality of the local trees used for sawdust or the natural outdoor mushroom fruiting conditions, customers can come to understand the quality and sustainability of each individual farmers’ growing methods on a more refined level. The growing medium for sawdust-grown shiitake, called substrate, includes hardwood sawdust and sometimes a variety of other dry ingredients such as straw, bran, or rye. Choice of substrate formula depends on what’s available locally, the regional climate, and the strain of shiitake grown. Alder, for example, grows plentifully in the region of Cascadia Mushrooms, and Winstead gets his alder sawdust from a local sawmill. The dry ingredients for the substrate are mixed together with water, then placed in small transparent mushroom bags that are heat resistant and breathable. The bags are then heat sterilized (such as with steam or pressure cooking) to eliminate spores of other types of unwanted fungus lurking in the material. The resulting sterilized sawdust is inoculated with shiitake mycelium and the bag set aside, often in a growing room, for the mycelium to grow or “run” -- doing its natural job of breaking down wood. That period can last from one to four months. Once proper growth in the spawn has been observed, various shocking methods -- such as temperature change or physical agitation -- induce mushroom fruiting for harvest. For log-grown shiitake, mushrooms are grown on hardwood branches or logs usually cut late fall to spring during the dormant season so the logs have the best possible moisture content. The size of the logs, sometimes around three to four feet long for easy handling and three to eight inches in diameter, depends partly on the source of logs, how they will be inoculated, stacked or leaned once inoculated, and otherwise tended to once they are filled with spawn and waiting for harvest. Sources of the logs are usually either the farmers’ own woodlot or logs resulting from timberland improvement. A row of holes is drilled into the log four to eight inches apart and about one and a quarter inches deep. Once that row is complete, the log is rolled to start another row two inches away, and this is repeated until the log is as covered with as many holes as possible without them being too close together. Every other new row starts halfway between the previous rows holes so distance between holes is staggered and a diamond shape is created by the holes once the drilling is complete. The holes are filled with loose sawdust spawn, which is a mixture of sawdust and the chosen fungal mycelium, then sealed with food grade wax. Alternates to loose sawdust spawn for log inoculation include shiitake plug spawn which are solid plugs that are hammered in. Also, thimble spawn is available. This type of spawn replaces the need for waxing by providing styrofoam caps already attached to the spawn. The drilling and filling process is slightly different for these alternatives, but the overall process is similar. Each mushroom farmer needs to study and perhaps even experiment with the various methods to determine which works best for his or her farming goals. The inoculated logs are then set, leaned or stacked in their waiting location or “laying yard” to colonize the log, which can take between six to 16 months. Once colonized, logs may naturally fruit, depending on the local climate, or the farmer can “shock” them by soaking them in cold water for 24 hours. This will force mushrooms to fruit within about a week. “Outdoor-grown shiitake logs like shade,” Winstead said. “In our area this is not a very hard thing to find. We grow ours in stacks in a grove of cottonwood trees. The trees provide a nice shady canopy during the summer when its most crucial and during the winter months, rain is able to fall unhindered on the logs because the cottonwood leaves have fallen. During dry summers we cover our stacks in 60% shade cloth and I'll turn a sprinkler on them once a week for a couple hours when it's not raining. Summer is also when most of the logs are in their fruiting cycle, so we submerge them in water for 24 hours about once a month to stimulate mushroom growth. For the aspiring shiitake mushroom farmer, live workshops (see resources below), preferably in a similar bio-region, can be invaluable. Regional hardwood sources, local climate including humidity, and sometimes the locality’s other native fungi species all play an important role in how a farmer will produce shiitake. Plus, there are numerous variables and precise applications to preparing sawdust or choosing and inoculating logs which benefit from a hands-on and locally adapted approach to learning. If workshops aren’t available nearby or if they are otherwise not possible to attend, a new mushroom farmer can also get a feel for shiitake growing in a distant learn-as-you-go way by obtaining pre-inoculated shiitake logs from a supplier and practicing growing shiitake within their own farm’s environment, asking the supplier questions along the way as they appear. 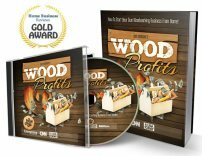 Some suppliers who give live workshops also offer consultation as well as print and online learning resources. Once farmers are certain shiitake will be a good fit, they may be able to continue to learn how to prepare the sawdust or logs themselves by learning from a distance. For example, the owners of Field and Forest (see resources below), a mushroom farm in Wisconsin, offer a helpful free video on their site which shows the process of inoculating logs with all three types of shiitake spawn -- sawdust, plug and thimble. Aspiring shiitake farmers can also check their own agriculture extension services. A handful of these offer publications or workshops on the topic of growing shiitake. As well, Cornell University (see resources below) has publications and free videos on eastern forest log-grown shiitake cultivation. Some of the information can be adapted to any location. A search for “shiitake” at the university’s website will lead to these resources. One of Cascadia Mushrooms’ marketing secrets is very similar to successful vegetable farms. Winstead communicates directly with his buying community. “My first customers were at the Bellingham Farmers Market (in northwestern Washington State),” Winstead said. “I began Cascadia Mushrooms at such a small scale that my first harvests wouldn't even last a full day at the market. This gave me the opportunity to try growing different varieties of mushrooms and test which ones people liked the most and which ones I could grow successfully. It was a few years of trial and error, and after lots of growing and testing it was clear that shiitake was where I wanted to focus most of my efforts. 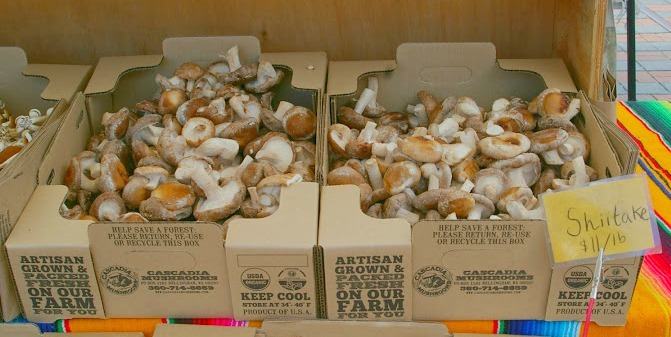 Winstead’s Cascadia Mushrooms has prospered from the popularity of shiitake. This mushroom gained a lot of culinary ground since it was once wild harvested in the forests of Asia. There are many particulars involved in growing shiitake, from finding a reputable spawn supplier to recognizing the ideal moisture content in local logs used for inoculation. But growers say it gets easier. Once the basics are understood, a grower can then adapt somewhat to his or her own growing region and goals for the farm. As suggested above, aspiring shiitake growers with a source of logs or growing medium may want to experiment small scale at first with a few logs or sawdust-grown mushrooms. 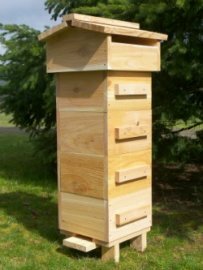 This will let them know if the labor and local resources for growing appear to be workable, while the particulars for growing shiitake in their climate are learned at the same time. Eventually, shiitake mushrooms may become a prosperous main crop as it has for Cascadia Mushrooms, or perhaps a valuable addition to other crops on the farm.